The scanner is powered on and connected to your Mac. Paperless is set to Use ScanSnap Manager is selected in Paperless preferences. In this article, we provide information to resolve issues reported to us most frequently by users attempting to import to Paperless from a ScanSnap scanner if all three of these condiitons are met. In order to take advantage of any recent changes made to ScanSnap Manager, be sure to apply any updates available for ScanSnap Manager from Fujitsu. 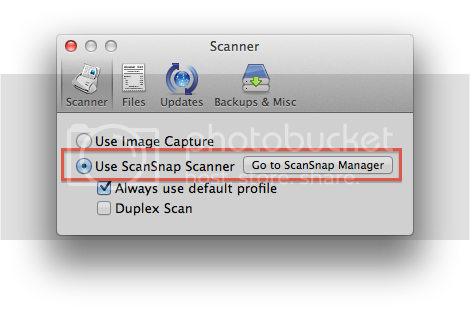 Recent releases of ScanSnap Manager can be updated from within ScanSnap Manager by selecting Online Update... from the Help menu. For full instructions on how to update ScanSnap Manager, please refer to documentation provided by Fujitsu. In order to take advantage of any recent changes made to the program, be sure to update to the most recent release of Paperless. If you are using a release of Paperless downloaded from the Mac App Store, Paperless can be updated by launching App Store and checking for updates. 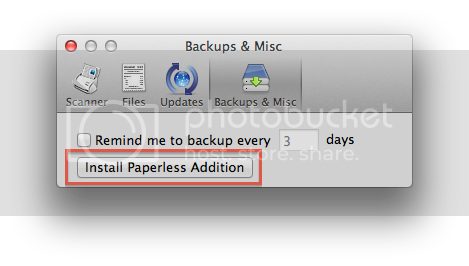 If you are using a release of Paperless downloaded from anywhere other than the Mac App Store, Paperless can typically be updated by selecting Check for updates from the Paperless menu. Note: If you are using Paperless 2.1.6 (or earlier) downloaded from anywhere other than the Mac App Store, you will need to download Paperless 2.2.0 (or later) manually in order to be able to update to the most recent release. The latest release of Paperless can be downloaded from the Downloads page on our Website. If you are using a release of Paperless downloaded from the Mac App Store, it is required to run an installer to install the scripting addition. After running the additional software installer, you will need to relaunch both Paperless and ScanSnap Manager in order to take advantage of the new software. This button only appears in preferences if Paperless was not able to find the scripting addition file in the expected location. We outline how to configure Paperless to import from a ScanSnap scanner in this knowledge base article. Here are links to knowledge base articles that provide resolutions to more specific issues. When I scan using the ScanSnap, I receive a message that The ScanSnap Profile named Scan to paperless does not match the Paperless Default Profile. What do I do? Where can I find basic information to configure Paperless to import from a ScanSnap scanner?